This plan was drawn in 1617, apparently from material dated seventy years older. In architectural detail, it depicts the gardens in the northeast corner, as well as the plan of the Newgate and Shambles market. C.L. 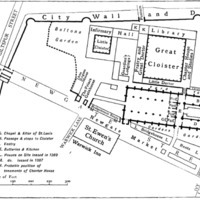 Kingsford, “Site Plan of Greyfriars (1617),” Medieval London, accessed April 22, 2019, http://medievallondon.ace.fordham.edu/items/show/169.